Check Back For Photos From the Novmber 23rd Show at Harpos in Detroit Michigan. California metal rockers DEVILDRIVER are preparing to hit the road one final time in North America in support of their latest release Beast. The tour is scheduled to kick off October 7th in Grand Junction, Colorado with a string of headlining dates before the band meets up with GWAR on October 12th in Philadelphia, PA to start the “Fate or Chaos” tour. 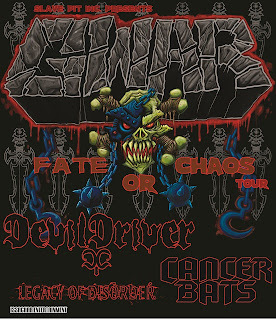 DEVILDRIVER will also play select headline dates during off days of the tour with GWAR. A complete list of tour dates can be found below. DEVILDRIVER was going to take some time off from our touring schedule in October and November, but when we were asked to support GWAR, it was a resounding YES in our Camp! The GWAR tour we did is still the most fun the band and I have ever had on a run and we are all excited and looking forward to these shows. Our crowds go together well and it will be Halloween Season so it seems appropriate and fitting we should be out on the road at this time and with a Timeless act like The All Mighty GWAR! HAIL to the Devils Duo about to ride together again!!! DEVILDRIVER recently announced their signing to Napalm Records. Following this tour, the band will take some time off and will then head out for a European tour in February of 2013. Look for the band to be back with their new album and Napalm Records debut in 2014. Concert Photos Magazine has a dedicated and growing group of concert photographers covering concerts and festivals across the U.S. and the world. We have plans for a major site re-design to bring new features and columns to the publication. Stay tuned!